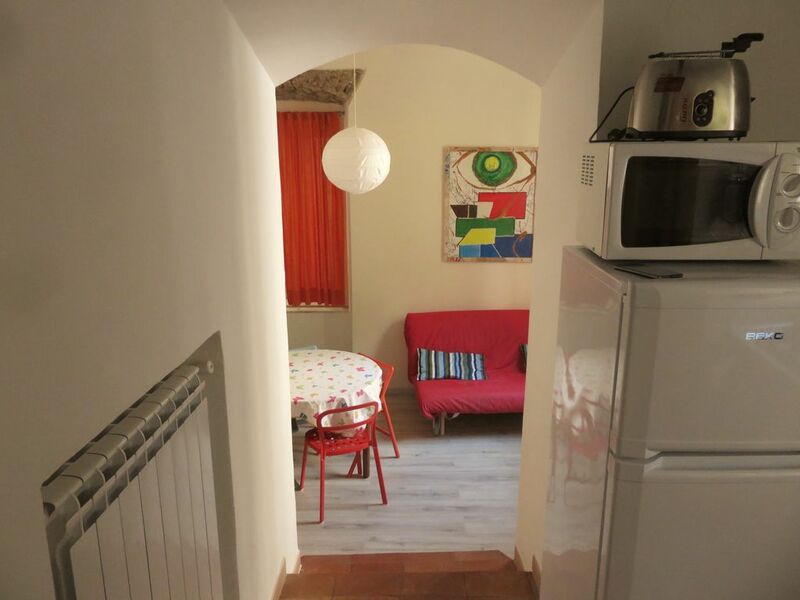 The appartment is located in the heart of Salerno, which has got some special characteristics, quiet but in the city center where you can get to the lively area with bars, restaurants and clubs within a few minutes on foot. The appartment of 40 mq with wireless Internet connection (24/7), has got a bedroom with a double bed, a living room with a double sofa bed (wide and comfortable for 2), a kitchen and a bathroom. The kitchen is completely equipped with dishes, pans, pots, glasses, cutlery, microwave, washing machine, and refrigerator. The living room is furnished with TV. There is a beach, 200 m from the apartment. Capri (1h40’ by hydrofoil), Positano (1h30’ by ferry) , Amalfi (45’ by ferry, 25’ by hydrofoil), Paestum (33’ by train), Pompei (44’ by train), Napoli (50’ by bus), Maratea (2h by train). 20’ to Vietri sul Mare where you have an access to Marina di Vietri, the first beautiful beach of the Amalfi Coast. 25' to Cetara where is one of the most popular beaches among locals. The apartment is in the upper side of the old city center. Just in front of the main door of the building there is a public elevator to go down, where you can find all shops you need. When the elevator is closed you go easily on foot. I'm Marco, I'm a teacher. I rent this property also becasuse I love to meet different cultures and way of life. In the heart of the old town of Salerno, in a quiet and reserved area. This is a bare-bones apartment. Clean, well stocked, comfortable. It's not fancy, but it is good for the price and location. It's within easy walking distance of several good shops and restaurants. Marco is friendly and helpful. My friend and I stayed at Marco’s lovely VRBO. We had a wonderful time. The bed was SO comfortable and the futon was too! The futon was much bigger than we expected and 2 people could easily sleep on it if necessary. Marco was an excellent host. He came over to meet with us twice to give us directions and to organize a taxi ride for us. He also made additional phone calls on our behalf to find out information about how weather conditions would affect our ferry ride to Positano. He was so helpful. The apartment is within walking distance to the piazza della Concordia dock (where you can catch a ferry to various spots along the Amalfi coast). I highly recommend this cute apartment. Agree with all of the previous reviews IVe read-this apartment requires some stamina to reach from the train station but couldn't have found a more thoughtful host! Marco was there waiting to greet us when we arrived, brought us an extra umbrella due to some spotty rain, offered to book us a cab when we thought we needed one to reach our restaurant to celebrate my birthday! The apartment is a good value for the money! May not meet everyones needs but was fine for us! Hosts were extremely responsive at all times. Marco deserves a 10, he went above and beyond to find a scuba diving activity for my daughter. This apartment is what I imagine as old world Italian, given that, if you have issues with walking there could be a lot of steps. It's on a hill, and one way into the apartment has a lot of steps about 3-4 floors worth of steps. There is an elevator but it shuts done at 9:00 pm. The apartment is very clean and the beds were comfortable. It has all the amenities you will need. Marco, was attentive and checked to see if we needed anything a couple of times and was prompt to answer any questions I had. The apartment is in the historic center of Salerno, in a characteristic area, quiet but central location that allows you to easily reach the central area of ​​the nightlife, with bars, restaurants and nightclubs. The apartment of 40 square meters, with wireless Internet access 24/24, a bathroom with shower, a double bed in the bedroom, a double sofa bed in the living room. The kitchen is fully equipped with dishes, pots, glasses, utensils, microwave, washing machine. The living room has a TV. At 200 meters from the apartment there is Santa Teresa beach with a solarium and beach services. Capri (1:40 a.m. 'by hydrofoil), Positano (1h30' with ferry), Amalfi (45 'with ferry, 25' by hydrofoil), Paestum (30 'by train), Pompei (20' by train), Napoli (50 'with bus), Maratea (2h by train).